Marcia and Millie Biggs, 11, are like any other sisters: attached at the hip and protective of each other. But they are often mistaken by strangers as best friends, not twin sisters. That's because Marcia has pale skin, big blue eyes and blonde hair. Her fraternal twin sister Millie is slightly taller, has darker skin, brown eyes and hair just like Marcia's – only jet black. 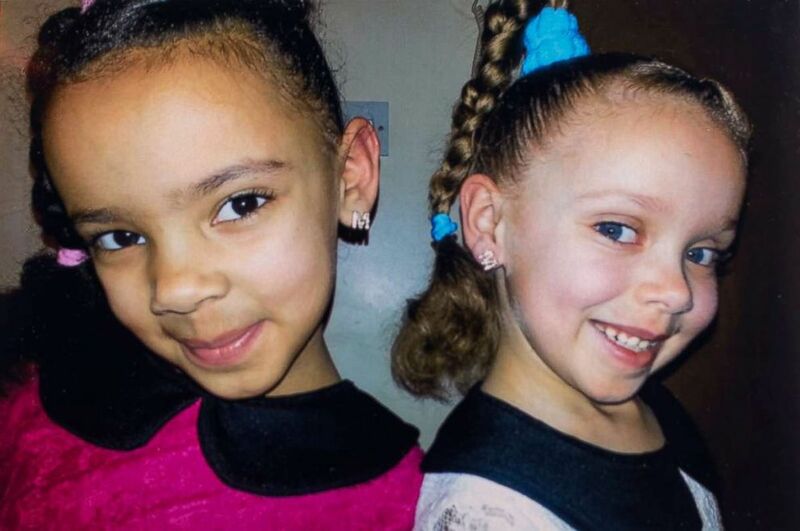 Marcia, left, and Millie Briggs are 11-year-old biracial twin sister from Birmingham, England. “Sometimes people don’t believe us when we say we are twins," Marcia told "Good Morning America." "They think we're just telling a lie." The twins are also featured on the April issue of National Geographic magazine. 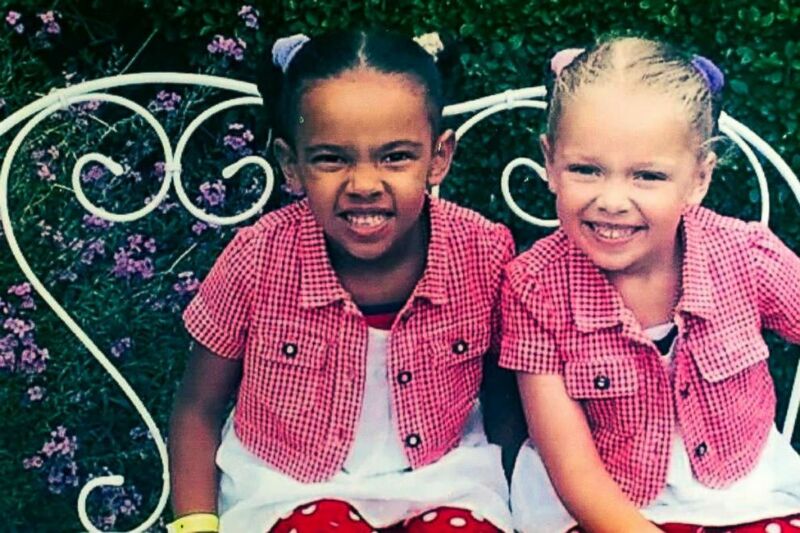 When they were born, the girls, who live in Birmingham, England, originally looked identical, according to their parents Amanda and Michael Biggs. 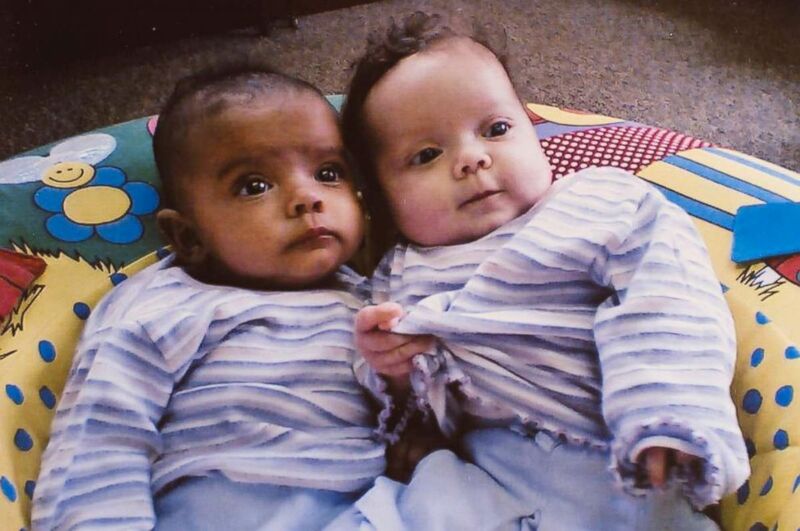 At 10 months old, the Biggs noticed a change in their daughters' complexions. Millie, left, and Marcia, right as babies. "The change happened with Millie first. She went darker and darker," said Michael Biggs, who has black hair and brown skin, stemming from his Jamaican descent. Millie, left, and Marcia, right sport matching outfits as kids. Fraternal twins, or non-identical twins, are the result of the mother releasing two eggs at the same time, both of which are fertilized by two different sperm. As a result the embryos share 50 percent of the same DNA with each other, making them no more alike than any other sibling. But the genetic makeup of Millie and Marcia has resulted in each twin predominately taking after one of their parents -- Marcia after her mother, and Millie after her father. 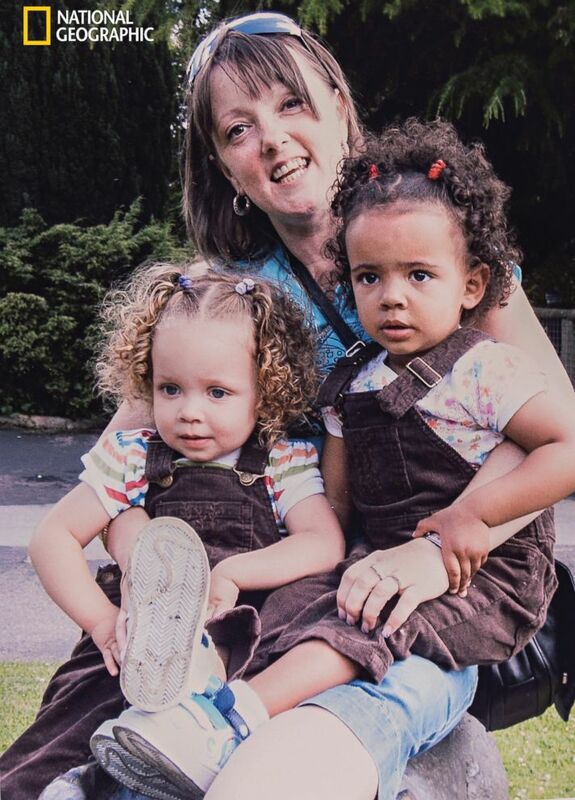 Millie, left, and Marcia, right are fraternal twin sisters who each resemble one of their parents. “Marcia is a bit of a tomboy. She loves her gymnastics and prefers the color blue," said Amanda Biggs. "But Millie is the princess – she loves pink and all things bling. She's a bit like her mother in that way." Amanda Biggs calls the girls her “one-in-a-million” miracle. 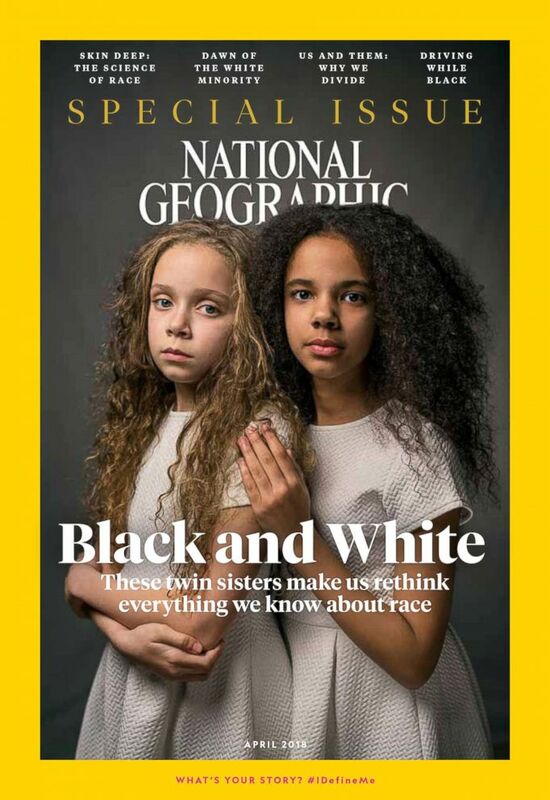 Marcia and Millie Briggs, 11-year-old biracial twins, are featured on the cover of the April issue of National Geographic magazine, a single topic issue on the subject of race. "Racism is where someone judges you by your color and not by your actual self," Millie said. She continued, "I prefer to be different. You don't always have to blend in the crowd because if you do you won’t get noticed. It’s better to be you." 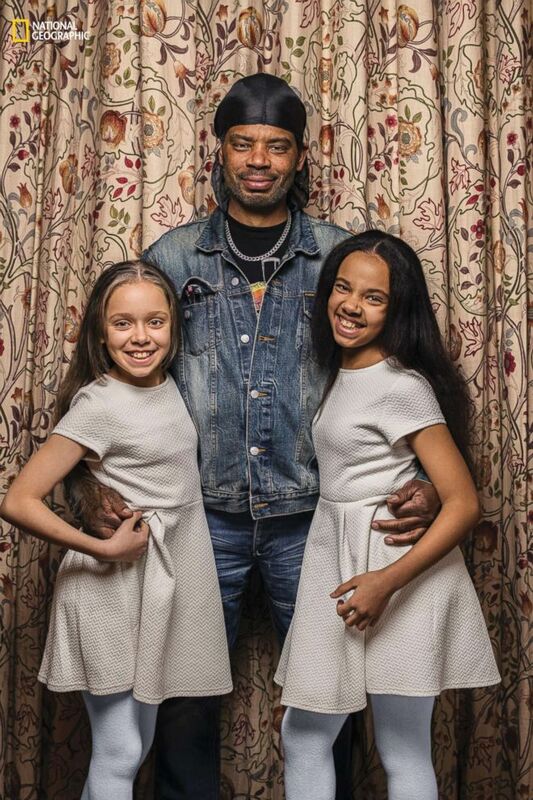 Michael Biggs sees a clear family resemblance in his twin daughters, Marcia, left, and Millie: "They both have my nose." The girls said they feel "proud" to see their faces on newsstands around the world. The twins later showed "Good Morning America" videos of the two of them goofing around on music.ly, an iPhone app that lets users record videos. Coordinated, upbeat and totally synchronized, the girls are clearly happiest and most comfortable when on their own, having fun as any sisters do. “They’re just that,” said Michael Biggs. “They just don’t see things in black and white." Even when the twins’ mother, Amanda Wanklin, center, dressed them alike, there was no mistaking one for the other.